Seriously though, we couldn't be more excited! Disclaimer: That picture was taken in October. I'm looking quite a bit rounder these days. So while I've definitely been relying on tried-and-true recipes for the most part, I've made a few new things. I can't say I found any of them worthy of posting, until now. This is a recipe I absolutely want to keep and make again and again! There's browned butter in both the cake and the frosting, so it's obviously one of the foremost flavors (hooray!). The banana is subtle in the very moist, very soft cake, and the cinnamon is strong enough to be noticed but not detract from the brown butter in any way. There's a pretty thick layer of frosting on the cake, but since that's always my favorite part of any cake (unless said frosting is made with pure shortening...blech), I didn't mind it one bit! My husband and I demolished this cake so quickly that I think I'll go ahead and double the recipe and bake it in a 13x9-inch pan next time. Don't judge me if next time is this afternoon. Preheat the oven to 350 degrees F. Grease an 8x8-inch baking pan with nonstick spray. To make the cake, first place the butter in a saucepan and heat on medium until the butter is completely melted. Turn down the heat to medium-low and whisk the butter. Continue to cook while whisking until the butter begins to brown and smell nutty. Set aside to cool. In a large bowl, beat together the egg and granulated sugar until fluffy. Add the brown sugar and browned butter and beat until the sugar is dissolved and the mixture is lighter in color. Beat in the vanilla. Mix together the flour, baking soda, cinnamon, and salt in a separate bowl; set aside. Mix together the banana and sour cream in another bowl and set aside. Alternate between mixing the flour mixture and the banana mixture into the wet ingredients, beginning and ending with the flour. Pour the batter into your baking pan and bake for 25-30 minutes, or until a toothpick inserted in the middle comes out clean or with a few crumbs sticking to it. To make the brown butter frosting, brown the butter in the same manner you did for the banana cake. Allow the butter to cool until firm; you can use the refrigerator to expedite things if necessary. With a hand mixer or stand mixer, beat the butter and sugar until well combined. Add in the salt, vanilla, and milk and beat until it is a smooth, creamy consistency. Add more milk as needed to create your desired consistency. Spread the frosting over the cooled banana cake. Love that family picture! So sweet :-) You have me at brown butter frosting..the cake looks really inviting, Grace. Happy to see you back to posting! This recipe is definitely a keeper - bookmarked. So excited for you & your growing family. This cake sounds amazing! I hope the rest of your pregnancy goes smoothly!! Hey this looks SOOOOOOO good .Reminds me of several recipes I know from growing up in a awesome mash up. I am in the mood for baking something in this cold weather. Will give this a try. Thanks for posting. Eva's just adorable, and I'm so happy for you with baby #2! 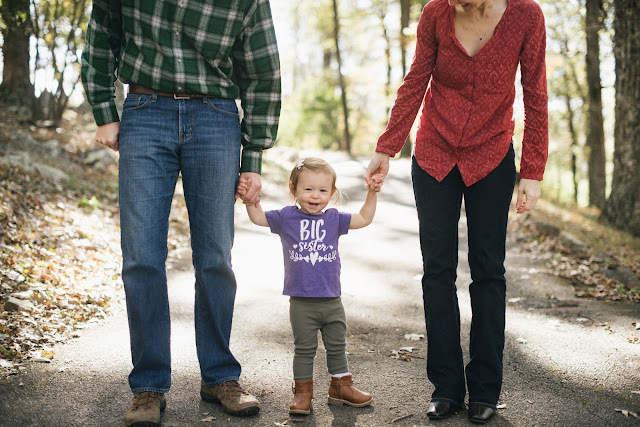 My oldest daughter's first will be 2 in March, and her #2 is due May 1st. It must be baby season. Congratulations again. Your banana cake looks terrific. I think making one every day is very acceptable. My daughter told me earlier that what Mini basically wants right now is for mama to eat sugar. 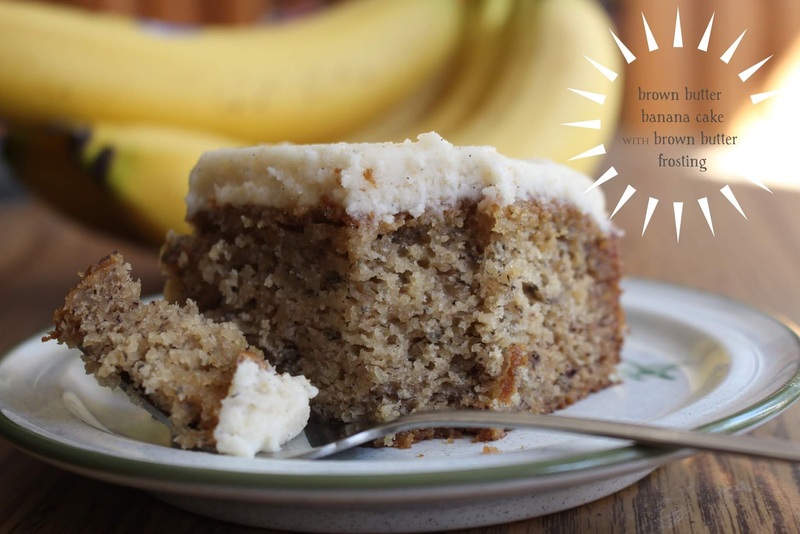 Sounds like a great excuse for banana cake with brown butter frosting. Browned butter makes everything better. It truly does. Even a plain bowl of pasta or couscous becomes something special with just a drizzle of that good stuff. Your family is growing! Congrats, the cake looks perfect! Congratulations! How exciting! I love brown butter so this cake is right up my street. Wow Grace you have your hands full now. Good on you for even making a cake!. it looks perfect. i love banana cake. Sounds delicious Grace--and your new addition is so close now! Congratulations!!! What great news I am so happy for your growing family :) This cake looks seriously good, I too would devour it in record time.